The Christian Science Monitor [LINK] does a decent job in smacking the media coverage of a new Nature Climate Change paper by Zhou et al. [LINK]. It is no surprise to see another example of the media making hay of a superficially surprising study. Most of the articles apparently get the story mostly right, but the headline writers once again have their heads up their asses... but actually not, as their job is to get people to read the headline and then click to get to the article in order for the ads on that page to load. One particularly horrible story comes from, wait for it, FoxNews.com; the story is titled "Wind farms are warming the earth, researchers say" and it is written poorly by Eric Niiler (of Discovery News?). I'm clearly not going to post a link to that story, but just say that it does not present a very fair assessment of the paper (which I did link to above and which I did actually read). The science of the study is nothing terribly exciting, but could provide observational evidence for the scale and magnitude of a simple mixing effect. The idea is that big wind turbines in Texas are mixing air in their vicinity, and at nighttime that means mixing air in two distinct layers. On clear nights, as the ground cools, cool air settles in contact with the ground. Cool air is more dense than warm air, so this situation creates a stable vertical structure of colder, denser air below warmer, lighter air. Usually temperature decreases as you go up, so we call this stable configuration an inversion. Just to throw some more jargon at you, this very common situation is a nocturnal stable boundary layer. The study finds trends during 2003-2011 in both daytime and nighttime surface temperature, but the larger and convincing trend is the nighttime trend, especially during summer. If you want to put wind turbines up, one attractive feature would be thin nighttime inversions and frequent low level jets. As it happens, Texas has a lot of places like that. 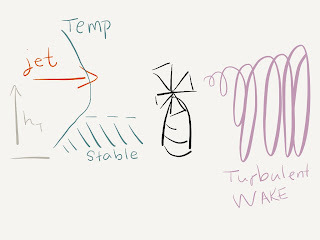 Note, however, that you would not want very strong winds on the top of the turbine compared to the bottom because strong torque is structurally undesirable. 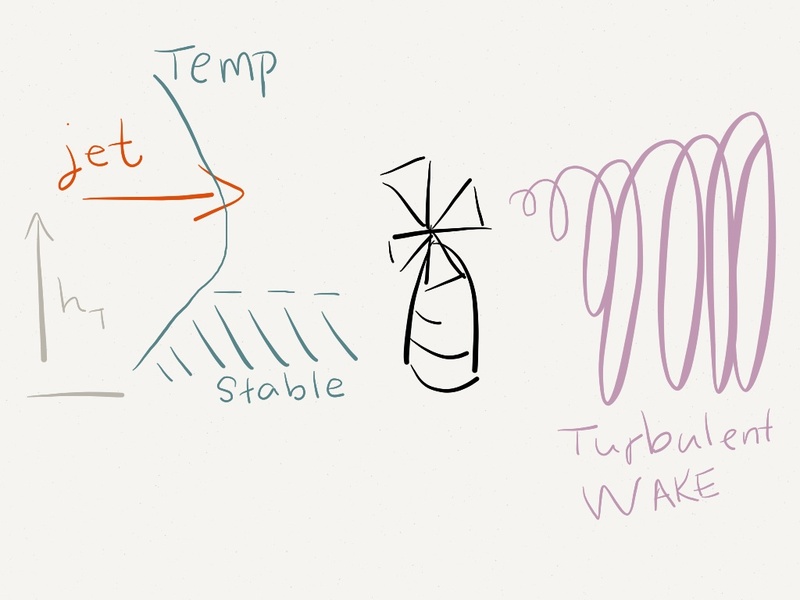 Let's imagine a turbine spinning in a low level jet above a stable layer (as in my awesome cartoon). The motion of the blades creates a turbulent wake just downstream, which mixes approximately isotropically. Let's say this means that the air is mixed up from the surface to a little above the turbine height. The result of this mixing is the same as if you stir a cup that has some warm liquid on top and cold liquid on bottom: the temperature is mixed and the resulting temperature is the mass-weighted average of the warm fluid and the cool fluid. This is exactly what the paper finds in western Texas, though they don't include a calculation of the efficiency of the mixing because their satellite data does not include profiles of temperature with height. The authors take the data in close proximity to the turbines, average it, and subtract the average from the data that is farther away from turbines. In the residual, they find this warming trend. This means that very close to the turbines, there is a nighttime warming trend, which the authors attribute to the mixing by the turbines. Finally, some of the blow-hards (ha ha, get it?) are saying that this warming could be bad for crops. It is plausible that crops are being grown within the small regions that could be affected by this nighttime mixing. If these people were so worried about warming affecting crops, I think they'd note that the local impact in western Texas is about the same amount of warming as the ENTIRE GLOBE has seen from greenhouse gases. A nearby weather station [LINK] shows a pretty clear warming trend (note there must be a site change or instrument change around 1959) and I'd guess that the overall 20th Century warming for western Texas is greater than the wind farm effect. The 1979-2005 trend looks like it is about the same size in summer [LINK], and note that is average temperature, not nighttime temperature which is the notable value for these wind farms. I'm not sure what 0.5C warming at nighttime does to crops, but I'm guessing that the greenhouse warming is more important (even within this study area) than the wind farm "warming."